The desert of central Australia is alive with the sound of music, though not the type that might be expected. 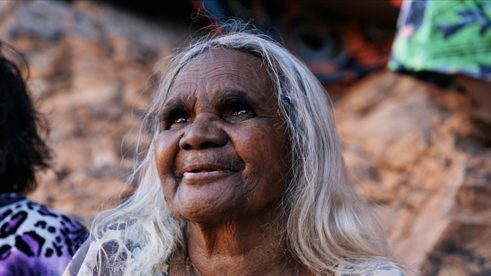 Across six remote communities spanning a thousand-kilometre radius, indigenous women gather to sing choral hymns originally brought to the area by German Lutheran missionaries, then translated into the Western Arrarnta and Pitjantjatjara languages. 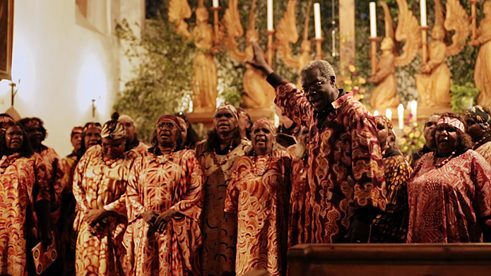 140 years later, the tradition still remains, with the Central Australian Aboriginal Women’s Choir (CAAWC) the only singing group of its kind in the world. 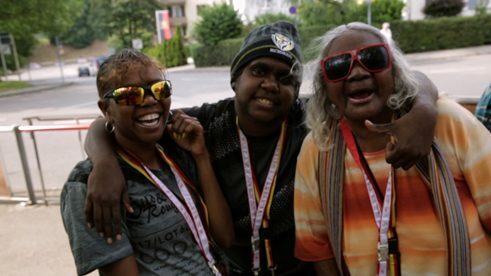 While the idea of Australia’s remote indigenous populace crooning centuries-old German tunes may come as a surprise — in fact, the practice nearly died out decades ago — The Song Keepers’ wonders don’t stop there. Resulting from months spent with the choir, more than 50 hours of footage and a historic tour of the European nation, writer/director/producer/cinematographer/editor Naina Sen’s documentary proves an enlightening chronicle of and joyous ode to cross-cultural collaboration, its power and its importance, as the planet’s oldest culture helps to keep some of humanity’s oldest sacred songs alive. Indeed, when choir conductor Morris Stuart addresses the crowd at Unsere Liebe Frau Lutheran church in Merkendorf, Bavaria on the group’s first performing stop abroad, his words strike a chord: “That is the oldest existing hymn of the Christian church. It was written in the fourth century in the Greek language, and it was revealed to me by the ladies from a remote community in central Australia.” Much of Sen’s footage is content to show CAAWC similarly sharing these otherwise-lost songs, whether simply with the audience through vision of their rehearsals, with their local communities or throughout Germany, and understandably so. To listen to the choir sing is to experience a blast of tuneful bliss, with their delight in their chosen art form infectious. Sen delves deeper still, however — and as astonishing as the underlying situation remains, and as vibrant as the melodies are to hear, it’s the stories behind the choir that resound even after the choir stops. Talking heads chat fill in flesh out the missionaries’ activities in the area after their arrival in June 1877, providing fascinating background details, while members themselves discuss the influence that the group has had on their lives. Variety comes in abundance: some have been involved for decades; others are newcomers. 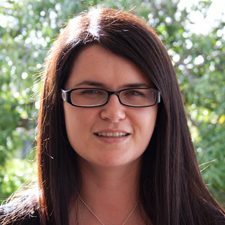 The majority are older women, though 24-year-old Heather stands out as choir’s youngest member, as does Nicholas Williams as one of only two male participants. All happily following Guyana-born Stuart’s lead, each relays their own stories with clear eyes, earnest insights and open hearts. The documentary 'The Song Keepers' features the Central Australian Aboriginal Women’s Choir (CAAWC) the only singing group of its kind in the world | The Song Keepers via MIFF It’s one thing to tell viewers that the choir makes a difference in members’ lives, preserves history, transports centuries-old tunes back to Europe and acts as a bridge between cultures most wouldn’t have ever anticipated; it’s another to see it in action. When the group embarks on their overseas tour, Sen’s task of documenting all of the above appears as easy as putting her camera in the right place, and not only witnessing the individual members’ reactions, but the also enthusiastic response from their German audiences. Given the scenario she’s capturing and the warm, passionate people she’s filming, much of the movie seems just as straightforward, though Sen and Bergen O’Brien’s command of the feature’s structure can’t be underestimated. Just as songs are fashioned to wring the biggest impact out of its individual elements, so is The Song Keepers’ compilation of observational and interview footage. The result, of course, is just as harmonious. The Song Keepers screens at MIFF 2017. For more information check out the links on the right hand column.